Can there be too many Gods? In this episode, I’ll ask if there can be too many gods. 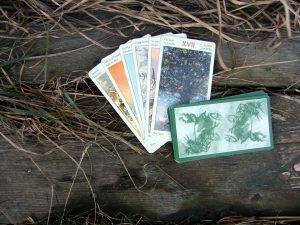 You’ll hear about the outcome of one of my tarot readings. I’ll talk about Bay Laurel for the herb, and I’m going to give you a prompt, something you can do easily and in a short amount of time, to get some magic into your day. Some people seem to do everything they can to reduce the number of gods and goddesses as much as possible. This is especially true for Asatru, the Scandinavian form of Paganism. The look long and hard for similarities, which they then say prove that a group of gods or goddesses were one and the same. I can’t understand why they do this if it isn’t to make Asatru more similar to, for example, Christianity. For what other reason would you want to merge deities who have their own personality and area of expertise with each other? the falcon cape; who says one couldn’t borrow the cape from the other? There are many arguments against them being one and the same, for example, the fact that Freyja is of the Vanir, and Frigg of the Æsir. They have very different personalities and very different fields of expertise. While Frigg is the more motherly type, Freyja is the more wild. Freyja is a death goddess too, claiming half of the warriors slain in battle, something Frigg isn’t. Frigg is known for her vast knowledge while Freyja is more known for her attitude, courage, and attractiveness, and her knowledge of Seiðr. The reasons for the connection between Freyja and Gullveig seems to be that she was of the Vanir, and the name Gullveig is connected to gold, which Freyja has an affinity for. As for the connection to Heið, the only thing connecting them seems to be Seiðr. The shamanic practice. Another example of this is people saying Oðr and Oðinn are one and the same. The reason here seems only to be etymology. These are my own opinions, based on my own research. I don’t claim to be an expert in this field. What’s your opinion on this? Should we look for these similarities and try to reduce the total number of Gods and Goddesses, or should we let them be separate personas? This was for a female entrepreneur and she said; What do I need to do to in order for my business ventures to succeed and become financially successful. Your business is either doing better than you think or will be soon. Celebrate the small successes and milestones, be proud of what you have accomplished so far. You’ve had a period of challenging effort, but the harmony, joy, and satisfaction will follow. Your efforts may be scattered and you are starting to question whether or not you are investing in the right areas. You may be spending money on things that won’t deliver results. Take a look at your current and planned investments (both financial and time), and make sure that you’re going to see a return on those investments. Prioritize to make sure you don’t waste time and money in areas that won’t deliver results. Take stock of what you still need to do and focus only on those things that will get you where you want to be. Confront your fears and assumptions to gain self-confidence and direction. You need to believe in yourself and know that it is possible to create balance in your life. You may also find that your dreams provide you with important clues as to what direction you need to take. Pay attention to the subtle, subconscious messages. You need to become more aware of the opportunities that exist for you right now, as there may be more than you’re aware of. You may get an opportunity to expand your horizons, through study, travel, or a joint venture. Consider what you can do to open some doors for yourself. The good choices you make will bring rewards. Your work is seen, appreciated and respected. Give yourself some credit, you have the right to feel proud. You may not be running your business according to your personal values, or you’re not being true to yourself. As a result, you may be questioning whether you really believe in what you’re doing. You need to get clear about what your personal values are and what is truly achievable. Your work/life balance may also be out of whack. Too much work and too little quality time. You may be feeling unclear about what you are really searching for in order to feel fulfillled, or you may be refusing to go within to ask yourself what will truly fulfilll you. You need to stop and give yourself some time and space to think. When you do, you’ll be able to set your intentions and find solutions. You may also be hiding something from yourself that is probably related to emotions. You need a period of reflection and self-evaluation. You may have had a recent realization that you need to run your business in a different way and be true to yourself and your needs. You’re getting close to the point where you need to take action. Trust your own judgment and know that you’re on the right path. If you need support, there will be others who have experienced something similar to you and who can show you the way to free yourself from your challenges. You need to be very careful of not rushing into things without thinking it through first. Even if you are starting to get frustrated with a lack of action, you need to consider the consequences before doing something. You may also find yourself feeling frustrated that there are certain factors that you feel are out of your control. Remind yourself that there will be things that you can control and change as you want to. It’s a good idea to become more diskiplined and focused on what you are doing. Look at what you can and can’t control. Don’t worry about the things you can’t control, but focus your energies on what is under your control. You need to be able to feel as if you have at least some direction. Just make sure to do things the way you want, not the way someone tells you it should be done. If you have some of the same concerns as her, you’ll find the link to the readings in the show notes. Today’s prompt: Autumn is coming here in the Northern Hemisphere, so make the most of it. Go outside and enjoy the season changing.